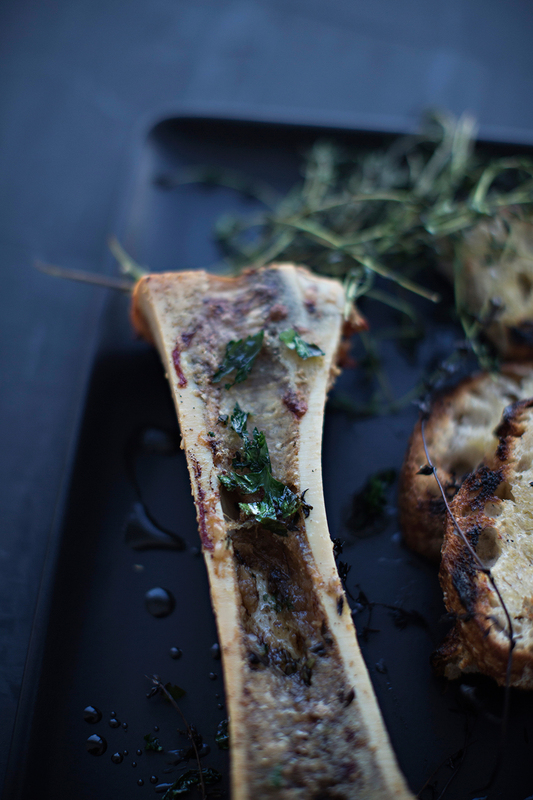 Place the marrow bones upright on a foil-lined baking sheet along with the thyme sprigs. Roast for 15 minutes. To make the toast. Drizzle the sourdough slices with olive oil. Place on a parchment-lined baking sheet and toast in the oven until brown, about 2 minutes on each side. Remove from oven and immediately rub with cut end of garlic. To serve, arrange the slices of bread alongside bone on a family style platter. Garnish with parsley and thyme. Scoop out the marrow and spread it on toast and top with sea salt and more parsley.